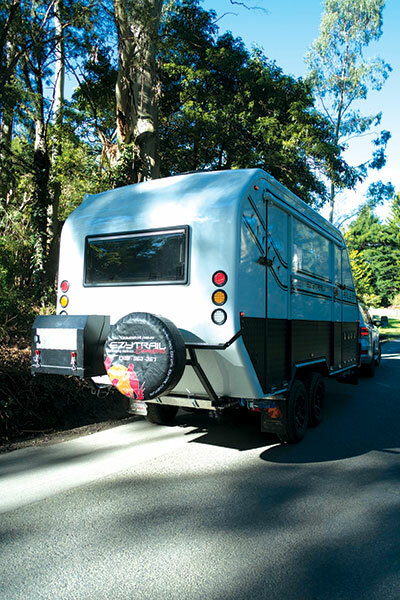 Buoyed by its hybrid caravan Parkes fleet juggernaut, Ezytrail is ‘testing the waters’ with what it justifiably terms a “cabin on wheels” – the Airlie GT 'EzyHab'. 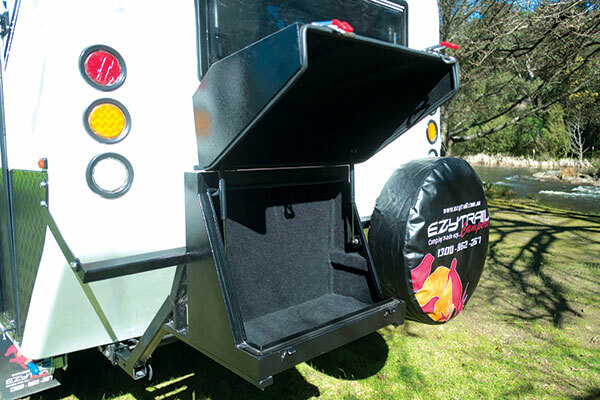 “The Airlie GT or ‘EzyHab’ will introduce new and different camping possibilities that are based on customers’ feedback, combined with the typical Ezytrail offroad abilities,” said Ezytrail marketing manager, Sagrys Aelbregt. 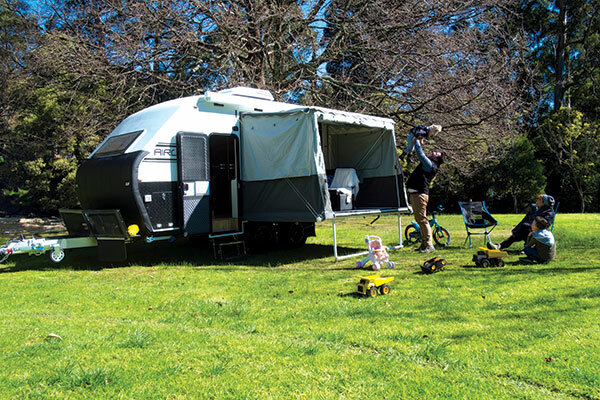 But it’s not pitching to a specific demographic with this rather unique six-berth, offroad caravan prototype – albeit family caravanning immediately springs to mind. “We’re throwing it out to all and sundry,” Aelbregt added. 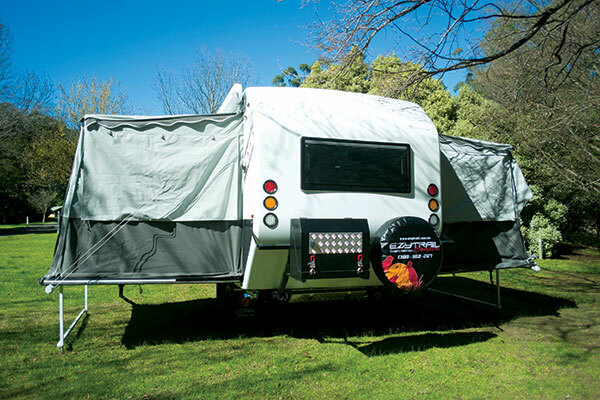 Ezytrail is renowned for its stable of hardfloor and softfloor camper trailers that arrive from China in a container before heading for fabrication and modification at its headquarters in Kilsyth, Vic. The Airlie GT is along similar lines, and once again Ezytrail’s considerable Australian design influence and R&D expertise comes to the fore in this preliminary version. “The ‘EzyHab’ comes in at an assembled stage. All parts that need to comply with Australian standards and regulations are then added, such as air-conditioner, fridge, gas and water plumbing and certification, bearings, brakes and suspension,” Aelbregt said. Okay, the 5.15m (16ft 11in) Airlie GT is a bulky brute for its dimensions, weighing in with a Tare weight of 2780kg – and that’s before you factor in a 720kg payload! I’m uncertain how it would stack up over corrugations out in the sticks, so I would have liked to have given it plenty of ‘curry’ over more hostile terrain (considering I had access to a Toyota LC200 Altitude press vehicle) but had to contend with some gentle slopes within the Warburton Valley, around 70km east of Melbourne. And I have no doubt the Airlie GT has the arsenal to survive remote off-grid expeditions for extended periods. It comprises a battle-ready aluminium composite and high checkerplate armour assisted by a sturdy powdercoat-finished 100x50x4mm Q345 (with 5mm-thick steel tube applied) RHS hot-dipped galvanised chassis and a robust fully-adjustable independent coil spring suspension with twin shock absorbers on each wheel. And it rides on 265/75 R16 A/T offroad tyres with 16in six-stud alloy rims, and has 12in electric brakes. 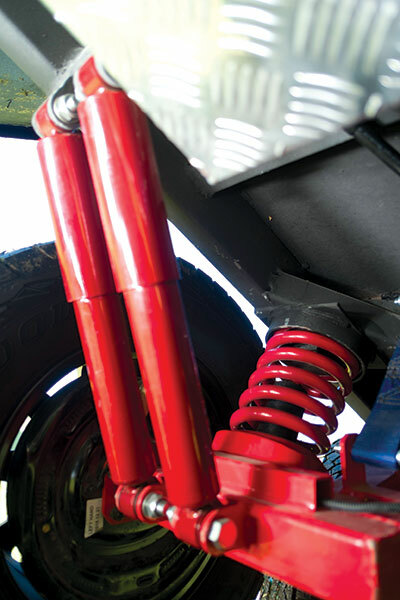 “Solid coil springs will bring the van offroad without hurdles. 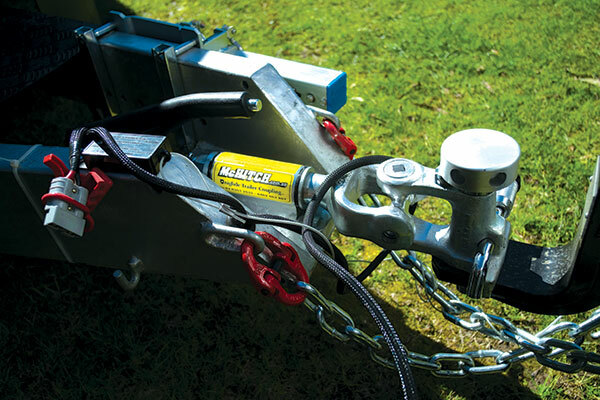 Our suspension system has been tried and tested for the last seven years and perfected since,” Aelbregt said. I’m also a big fan of the Airlie GT’s battery (3x100Ah deep-cycle AGM) and water (2x160L) capacities – the batteries and stainless steel water tanks (with separate electric pumps) all have 2mm-thick checkerplate guards. Obviously both arrangements are ideal for lengthy stays off the bitumen. However, on the negative, it’s sans solar power and grey water. But what really makes you sit up and take notice are the two fold-out compartments – a master bedroom (nearside) and a living room (offside) – swathed in canvas. The canvas is made from high quality 420gsm polycotton fine weave canvas and all stress points are double stitched throughout for durability. 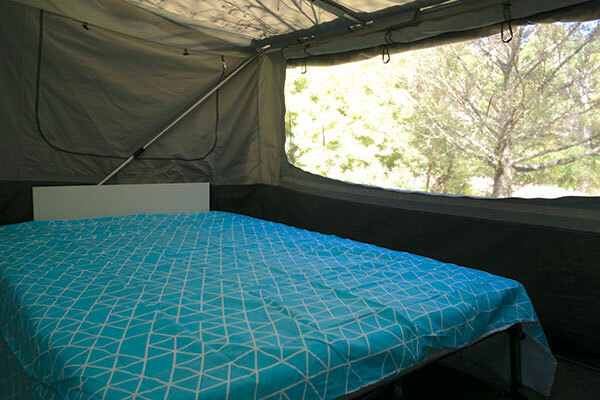 And both fold-outs have stable and sturdy platforms (a specific designed skirt keeps the critters out) that sit above ground level courtesy of stabiliser bars with adjustable feet. The marine-carpeted al fresco area enclosure (living room) is akin to what you’d see from a contemporary home designer. It’s a plush – and eye-catching – living room complemented by oodles of space. In fact, it’s like a private balcony! 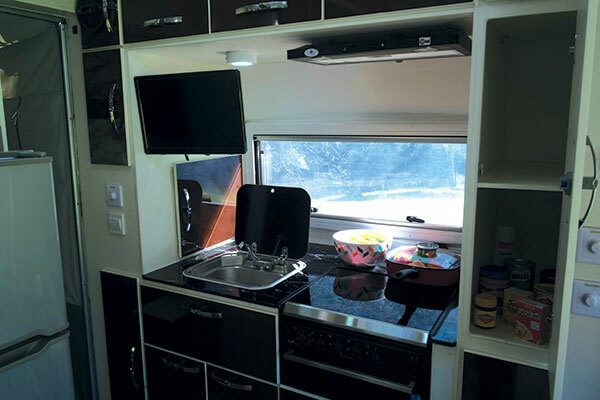 The internal kitchen has all the requisites you’d expect in any caravan, including a Swift 500 Series four-burner cooktop and grill, 12V rangehood, 20L NiceSea Electric microwave, sink and tap. And topping it all off is a sizeable 190L Dometic fridge/freezer. I also appreciated the storage space in the galley, but I reckon more room elsewhere in the van could have been devoted for packing away clothing and linen etc. 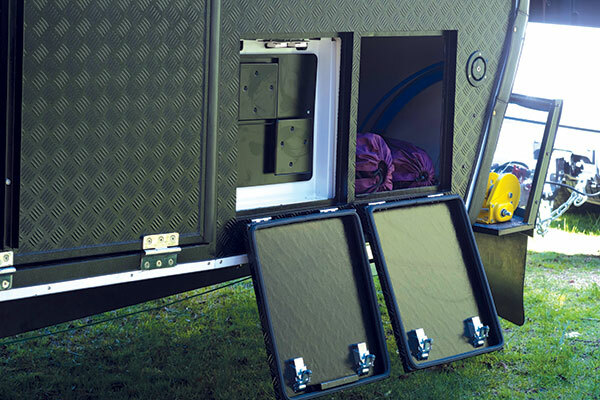 There is sufficient light and ventilation in the van, and climatic control is provided by a roof-mounted Dometic CALR242 reverse-cycle air-conditioner (an updated version of the CAL242), with 2.3kW cooling and 2.1kW heating capacities and an improved modern air distribution box with a digital display that can be controlled via a remote control. Meanwhile, hot water is delivered by a 28L Swift gas/electric unit. 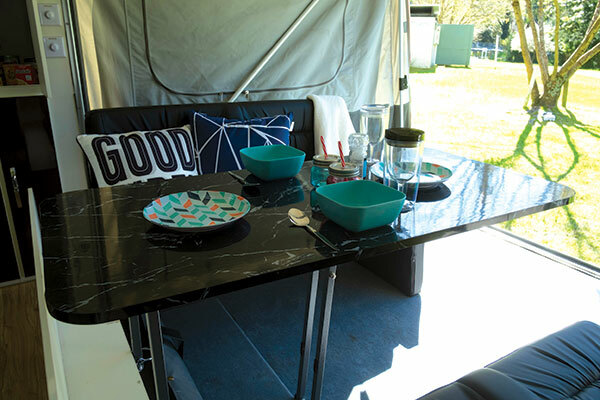 But I did like the van’s interior colour scheme consisting of cupboards with a black/brown gloss fascia finish and white marbled benchtops, while the floor has a timber laminated finish. The Airlie GT ‘EzyHab’ is an unusual but highly effective design – almost a ‘hybrid’ in certain ways. Yes, the ‘tale of the tape’ reveals it’s a beefed-up beast; in fact it’s built like the proverbial brick outhouse! But paradoxically it’s the brawny chassis and suspension that increases this prototype’s genuine offroad credentials… I’m sure it wouldn’t break up under topographical duress in the outback. The full feature appeared in Caravan World #568. Subscribe today for the latest caravan reviews and news every month!